Is it just me, or are Barycenters glowing? I've been reporting this bug since 974 beta 2, and that time I felt quite surprised since this bug WAS solved by a tecnical hack in 972 release. Well that's just great. 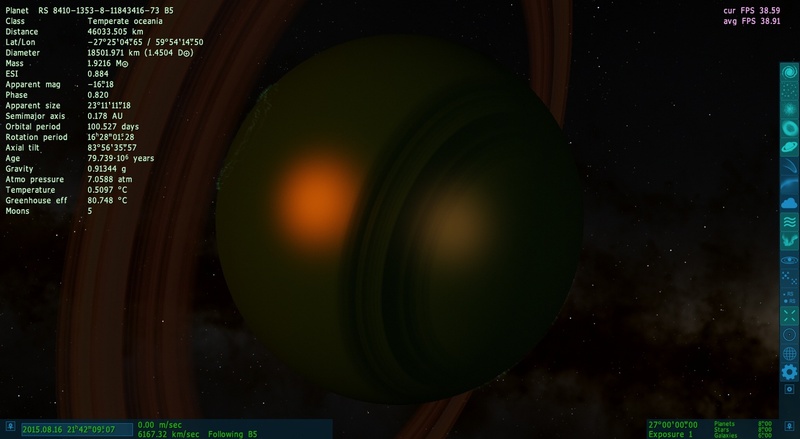 I updated my graphics drivers, and doing so broke space engine. Fantastic. EDIT: I booted and rebooted the game a few more times, and it seems to be a one time Error. It might be related to my task bar, which is on auto hide. THe game crashes on startup when the mouse is holding the taskbar up at least once a day, but other than that SE boots fine, normally. (Much later edit): I've noticed a bug with Oceanias, where the specular reflections will not show up until one gets closer to the Oceania, or until atmospheres are turned off. SE.log is included in the zip, which has the place location and the screenshots. Not sure either where to post that or open a new thread as it is only one question and maybe off-topic as well. I'm sure you are aware of the hyper hyped No Man's Sky game. I was wondering if you plan to arrive or to approach such a level of detail on planet with life... Dense grass, under water life, different fauna and flora species, etc. This is maybe the more impressive thing of that product, and only that. Because for the rest, they seem to somewhat mislead people when talking about the all universe simulated when they are only showing what they called the galaxy with a bright center where the player is invited to go... That's odd. Side question: will you update Pluto/Charon visuals soon? I mean even only with the general picture of the planet on New Horizons approach (which is beautiful) and completing the other side of Pluto by procedural generation (same for Charon)... Would be nice. I seem to be unable to launch the game without an internet connection. Is this a bug or just me? You don't need any type of connectivity to run the engine. What...? That's... weird, I mean, that must be an O.S. problem. Hmmm... need to check this out. But is there any news about those acreation rings around black holes? are they going to look similiar to those in Interstellar movie? Do those black holes emit light like stars? When do you think they are going to be added? @Zefnoly : Accretion disk of black hole is not very realistic in Interstellar (even if it's very nicely rendered). There, is, for example, no asymmetry in the light produced (which should be very high, considered what we know about it with the position of the planet). Moreover, the light should be more red, where is it nearly blue in the movie. For more information about black light and light emission, you should read more about it (even wikipedia page should be enough). The answer is "it depends". I agree. About brightness, well, considering the temperature around this particular BH, we can suppose it would be very very bright, but not perhaps in visible colors. What is it that sometimes the gas giant's atmosphere patterns disappears? Only monochrome (without clouds , spots) , looks like a billiard ball. If you exit the program and restart, then SE works well again. While in spacecraft control mode (4) How do we set Target to None after selecting a target in latest 05 patch ? Hello Space Engineer. I am still facing a problem opening SE in windows XP. I think it was a compatibility issue in windows XP from 0.9.7.2 which was said to be corrected in 0.9.7.3. But for some reason doesn't work for me. I installed 0.9.7.2, then downloaded 0.9.7.3 and installed it as directed in the instructions but it doesn't work . For my satisfaction I also downloaded 0.9.7.4 beta and copied it in SE appropriately but no luck. 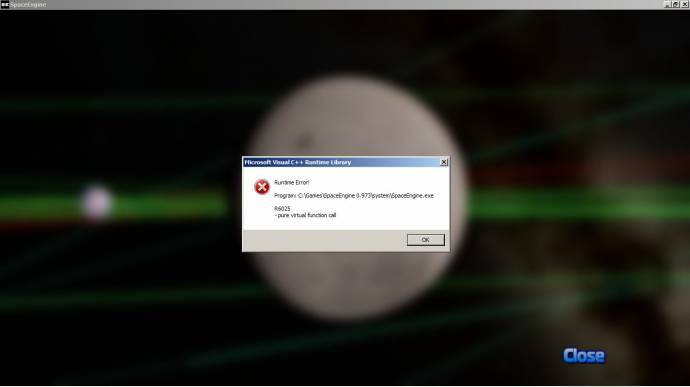 Here is a Screenshot of the error message that appears when I start SE.